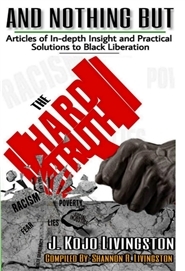 And Nothing But The Hard Truth is a compilation of articles written by my late husband and Pan African grass roots activist, preacher and journalist, Kojo Livingston. Kojo worked for over 40 years in teaching and laboring with many black communities to gain true liberation for Black people. I compiled these articles in honor of his legacy. These articles are taken from his Hard Truth column featured in the Shreveport Sun of Shreveport, La and the Louisiana Weekly of New Orleans, La. He gives powerful insights and practical ways to achieve true freedom. This book is a MUST read for anyone serious about the work of real liberation.